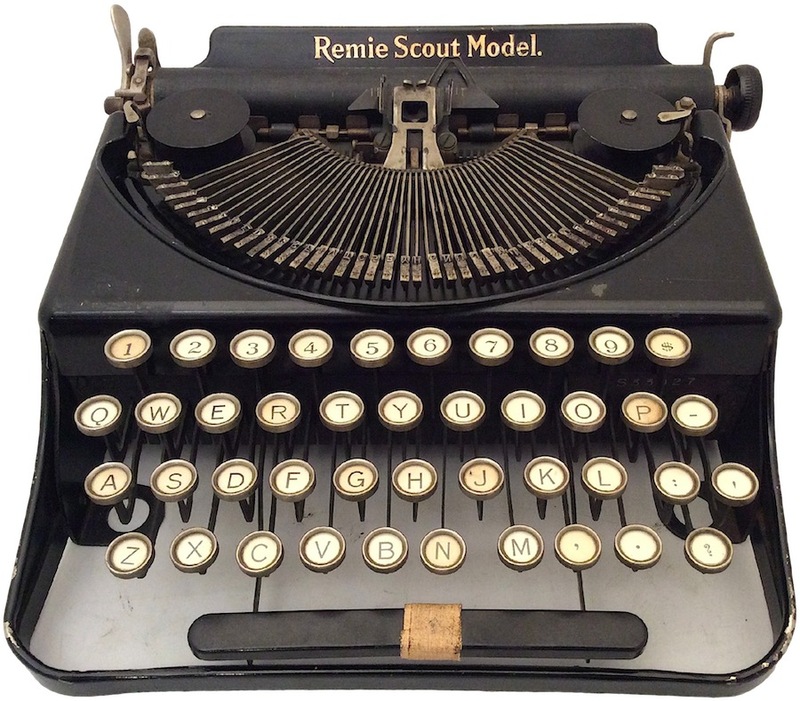 Here’s an interesting variant of the Remie Scout Model that features white key-tops and an improvised front frame. 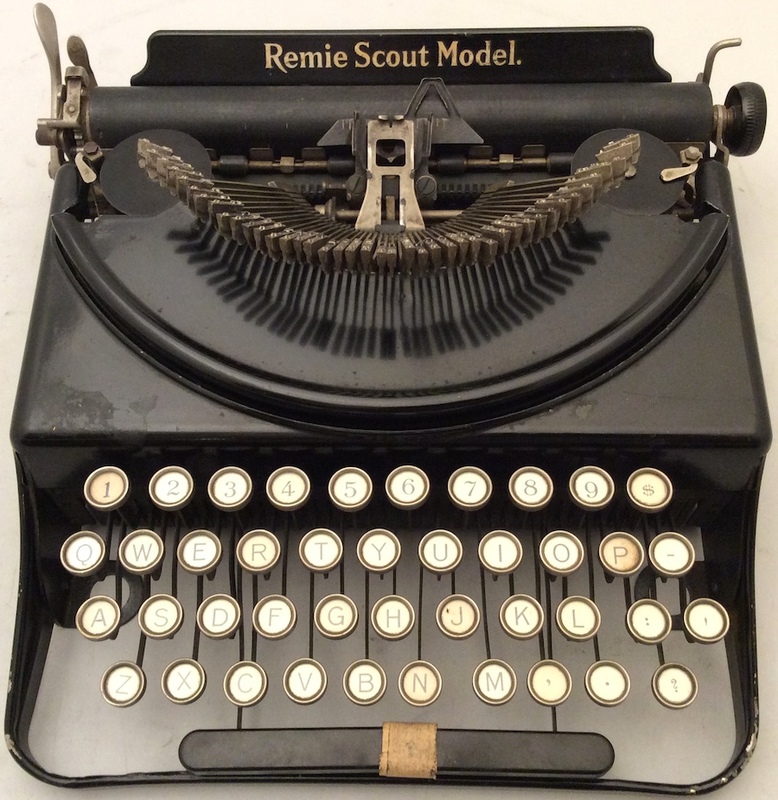 It is a caps only version of the Remie Scout with an attached piece that encloses the keyboard. 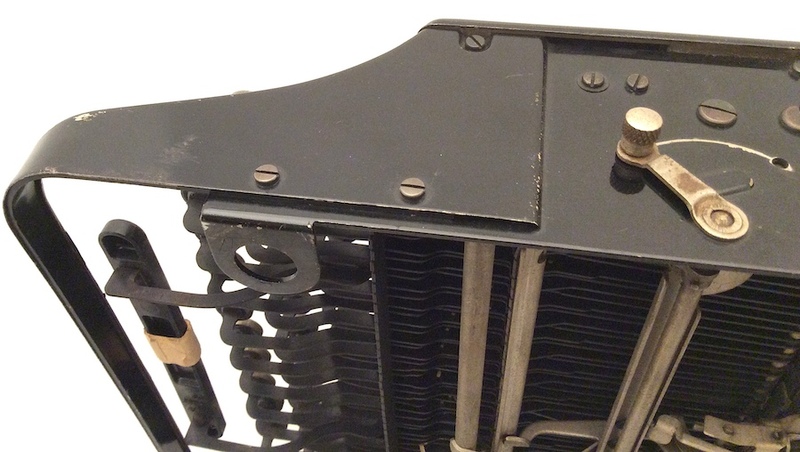 It is held in place by six factory-standard screws, but the holes for some have rough edges, indicating these were machined afterwards. 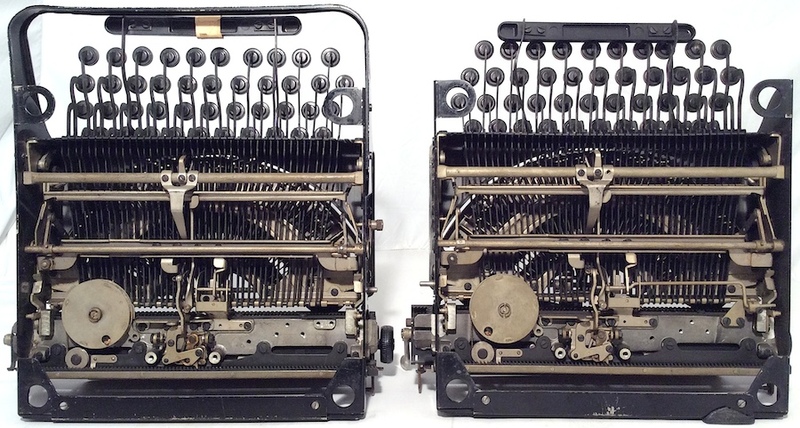 This ad features the less common caps only machine with enclosed frame. From The Milwaukee Journal, Aug. 20, 1933. Note (8/28/16): Yet another modified Scout has been sighted. Read about it here. 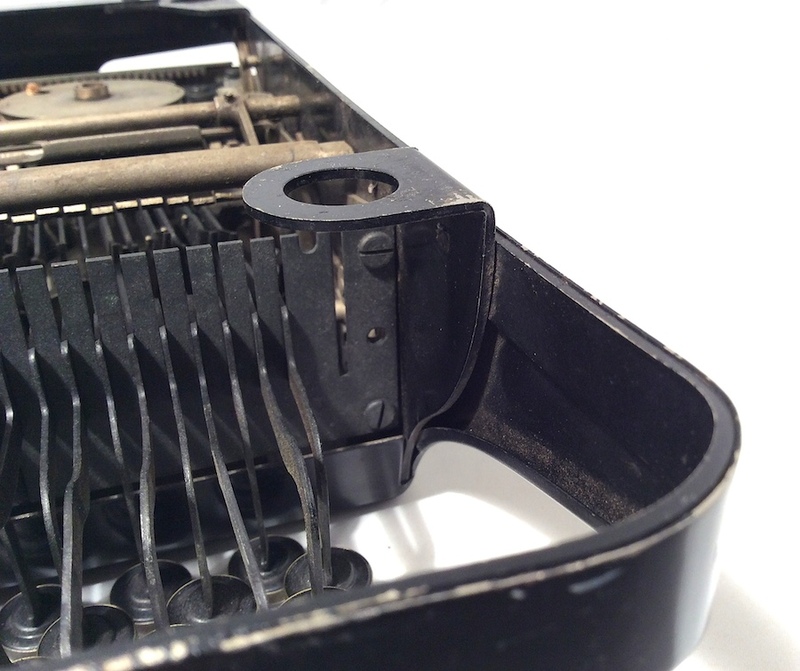 Note the front enclosure piece, mounted by three screws on either side. This appears to be a simple modification, either conducted in the factory or by a dealer. The paint under the improvised piece is black. The screws are factory standard. 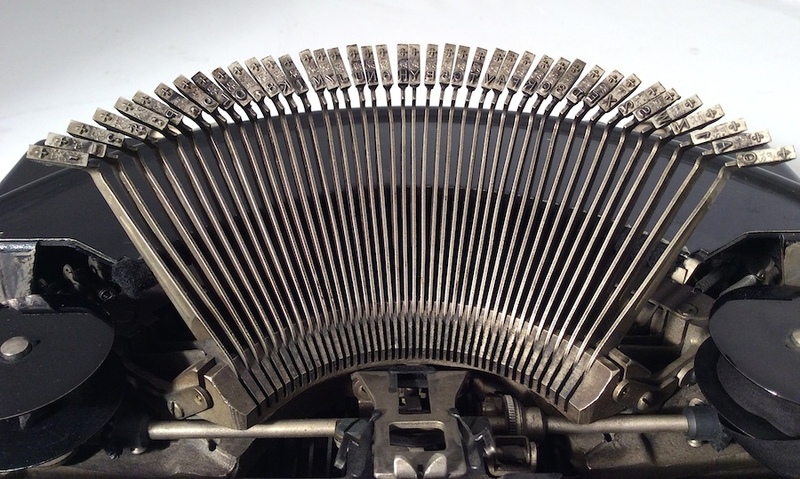 The underside of the enclosed variant. Definitely an afterthought. 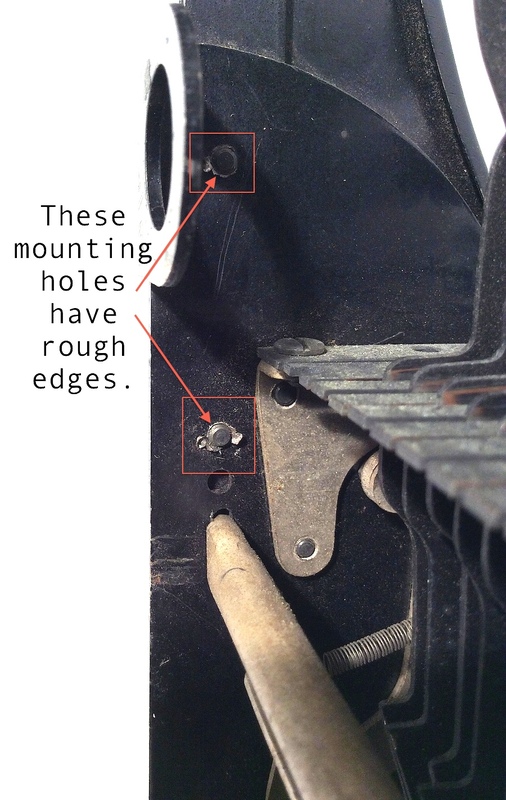 The newly drilled holes are rough with sharp shards of metal protruding. Not sure why numbers are etched under the space bars. Caps only. Art Gothic typeface. Top: Typeface from double-case Remie (taller, narrower). Bottom: Typeface from one-case Remie (shorter, wider) — same as my other one-case, no enclosure Remie. © 2014 – 2016, Mark Adams. All rights reserved. They are very similar — I just posted a comparison of the typefaces — but there are subtle differences. 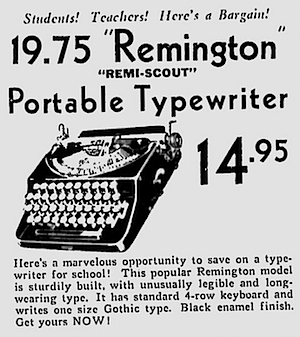 Remington only ever seems to have advertised this typeface as Gothic. Neat that. Never realized the ‘full frame’ Scouts still used the single frame for most of the machine and bolted on a front bit only of the outer frame. 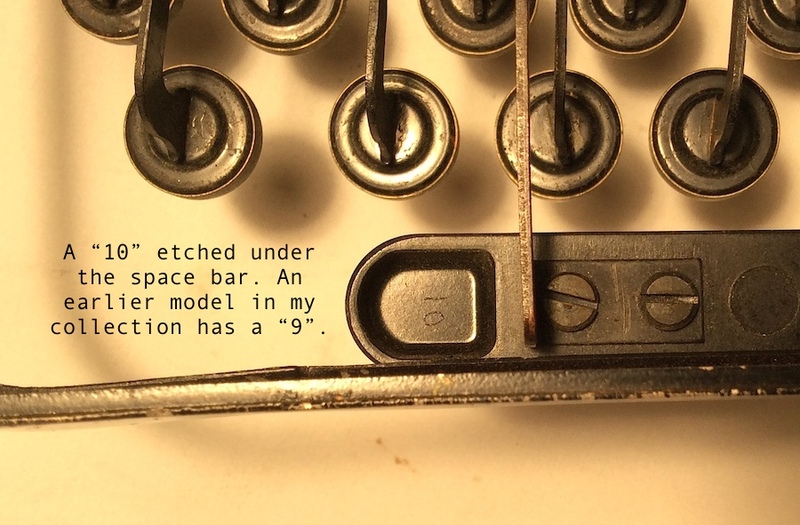 The number on the spacebar is probably a mold or a cavity number. Also for thermo-setting materials you’d number the cavities in a mold (to be able to identify what part came from what cavity). Some enclosed one-case Remies are single-piece framed (as in the image in the ad); only rarely, like mine, are they two-piece. Enclosed one-case Remies are altogether uncommon. 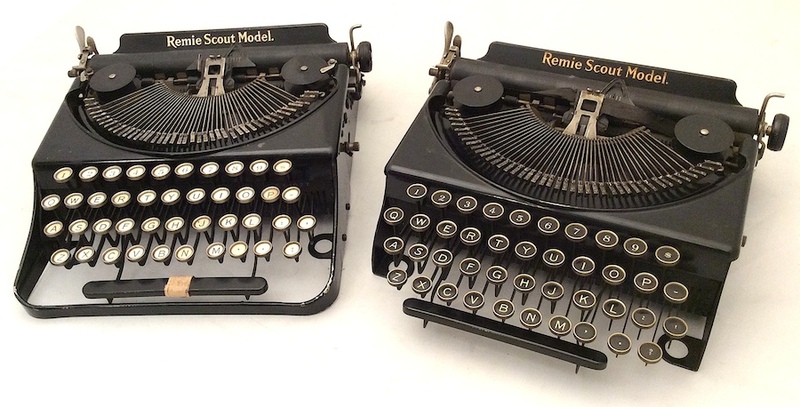 Here’s an interesting Remie Scout that just showed up on ebay—It was refurbished and modified at some point probably in the 1950s, but it has the same front piece as yours, though in blue instead of black. I saw the same listing — what timing, really! The blue paint is likely original; the grey, almost crinkle paint is possibly a modification, though I have seen that paint on other Remingtons (so it could be original). The eBay listing is more complete than mine, having the base plate and rubber feet.